Now is the time for conservation science—a mission-oriented scientific enterprise that seeks to protect nature, including Earth’s animals, plants, and ecosystems, in the face of unprecedented human demands upon the planet. Conservation scientists apply principles from ecology, population genetics, economics, political science, and other natural and social sciences to manage and preserve nature. 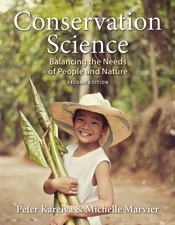 The focus of this textbook is first and foremost on protecting nature and especially Earth’s biota. It also contains a heavy emphasis on highlighting strategies to better connect the practice of conservation with the needs and priorities of a growing human population. Now used at over 150 colleges and universities, Conservation Science is an original and modern approach to conservation. Gretchen Daily (Stanford University) says it well: “Based on unparalleled, firsthand experience, Kareiva and Marvier explore the innovative approaches to conservation being honed around the world today. Their account is rigorous and engaging, with fresh questions, data, and quantitative analysis interwoven with vivid stories of actual conservation practice in the field." Conservation Science was primarily written primarily for undergraduates and beginning graduate students who are interested either in academic careers or working in conservation at government agencies, non-governmental organizations, or international institutions. The authors describe the innovative approaches to conservation being practiced around the world today—from advances in fundamental research through to their application in some of conservation’s most difficult practical and ethical situations. Throughout the text the authors prompt students to think critically and develop their own positions on conservation’s key debates. See the “Consider This” essays following each chapter. The authors engage the reader through Discussion Questions, as well as Group Projects that utilize global conservation data available through highlighted websites. Chapters on forests, fresh water, agriculture, and marine fisheries offer a unique and realistic view into how conservation is being practiced today. Every chapter has been updated with the latest scientific developments and new case studies. The new edition is accompanied by an online assessment website that allows students to test their understanding as they read.